Fourth grade students at the Allen County Intermediate Center learned about caves and how to safety explore caves last week as part of a continuing educational partnership with the Mammoth Cave National Park. Each month, rangers from the National Park visit ACIC to present educational programs to students. This trip included a special visit from Colorado-based CaveSim. The cave simulator was made possible through funding provided by Friends of Mammoth Cave, a non-profit group which supports special projects for Mammoth Cave. Students learned about crawl space by given the opportunity to crawl through a box that was set at different height levels. The box was a hands-on way to educate students about a basic rule of cave exploration---the importance to know how small of a space one can safety pass through. 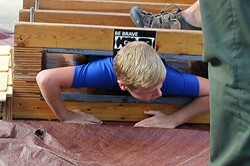 Students and teachers were given the chance to crawl through a space, a space decreased in size after students successfully achieved a height. However, the highlight was the simulated cave experience. The cave simulator was introduced to the students by its creator, Dave Jackson, an electrical engineer graduate from MIT (Massachusetts Institute of Technology). Jackson explained why the simulator is more than just an educational tool for students. The simulator also allowed students to watch on video monitors their classmates and teachers pass through the cave. Jackson also spoke with the students about rock formations inside the cave and about the importance of cave preservation. In addition, Jackson reminder the students of the importance of math and science as a foundation for learning and future endeavors.